Ahh, we're back. After a bit of a trying week, we are back. Maybe not normal yet, but better. Up and running. Stronger and with more momentum. I like that feeling of gearing up. The lists, the planning, the thinking, the ideas and the doing. As a new project takes off, so does my heart and soul. The different possibilities bring optimism into my little corner. This little boost pushes me off my landing spot and into the wind. And I feel free again. Life is a bit of a roller coaster. That is so cliche, but as I get older, it is so true. My roller coaster travels from intense deep dark blue to the lightest of yellows. My lows are darker, grumpier, and more achy. My highs are light, breezy, and floaty. And it is a fact that my path travels to both ends. Life modulates. I have tried so hard to control it. "I'd be so much more productive if I could just extend those highs. How do I avoid those lows? Exercise. Diet. Medication. Supplements. Lifestyle." But the only thing I've found to be true, is to embrace it. Rest when the body says to rest. Leave the guilt of nap-time hours behind. Productivity will pick up. It will soon. And without variety, this wouldn't be...life. So take each day as it comes. Be productive when the body and the inspiration allows. Rest when there is no other choice. And embrace your soul, the time you have here on this earth, and live each day to its fullest. I know I can't do any more than that. We are sorely in need of some cute wall art in this house. I've been eyeing so many butterflies on the Internet lately and since spring is in the air, I decided to invite some into this home. 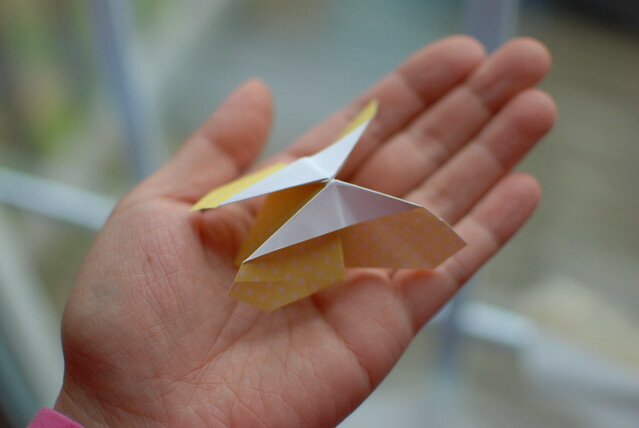 I found this site for all things Origami butterfly. I looked at about half the links, but there are so many other patterns out there to explore! Take a look around and see which one you like. This is a very simple, very budget friendly piece to put together. I found all the items I needed around the house. 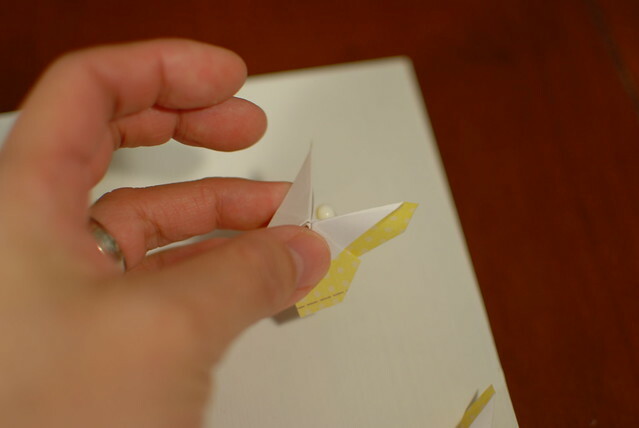 Most of the project time is spent waiting for paint to dry and folding paper. NOTE: I did not affix a hanger on the back of my piece. If you would like to hang your piece, select an appropriate wall hanger and attach it to your board, BEFORE you start in on the rest. 1. Sand scrap wood until edges and faces are smooth. Remove any dust and debris with a damp cloth and let dry. 2. 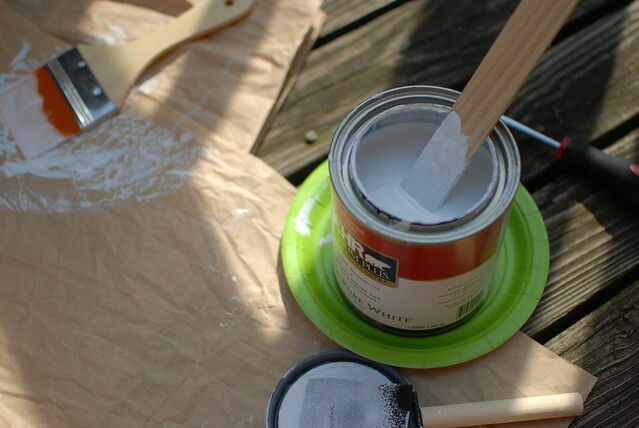 Paint scrap wood white with paint and brush. 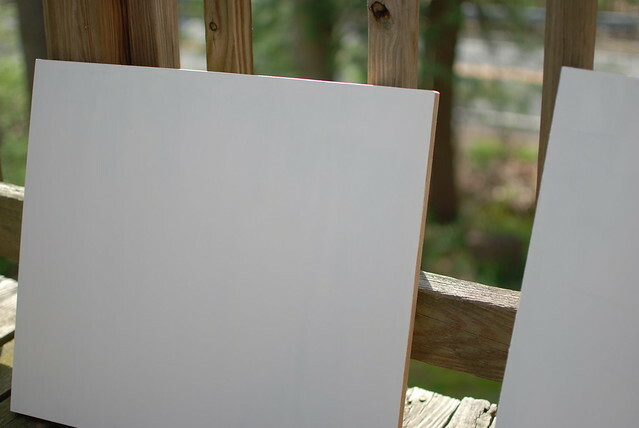 You many need to do two coats, letting each dry in between. 3. 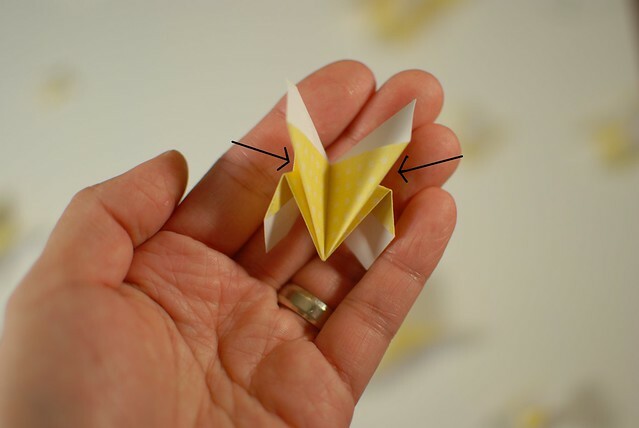 Go here to find out how to make the origami butterflies. This is a very complete and easy to follow tutorial in my opinion and she gives you two sizes to choose from. 4. 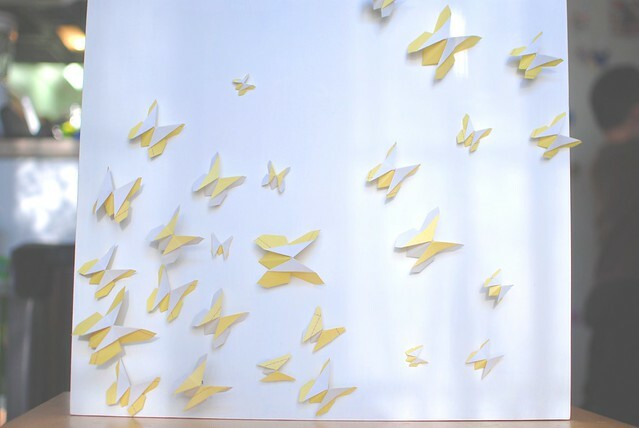 Measure and draw as many rectangles for as many butterflies as you'd like. I varied the sizes of mine and I just kept on making them until I got tired of making them! 5. 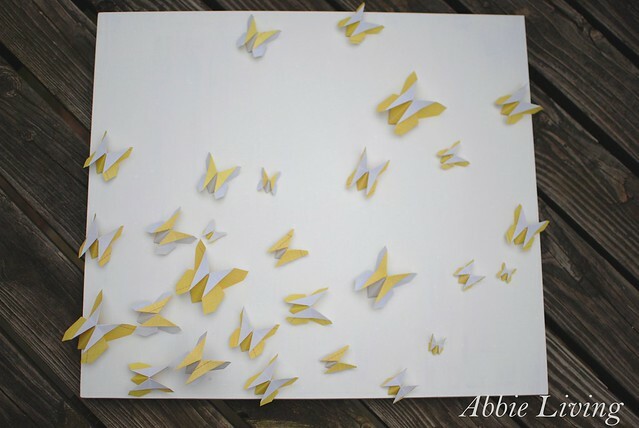 Lay out your butterflies on the white piece of wood. I choose to make them all face more or less one direction. Then choose which you'd like to elevate. 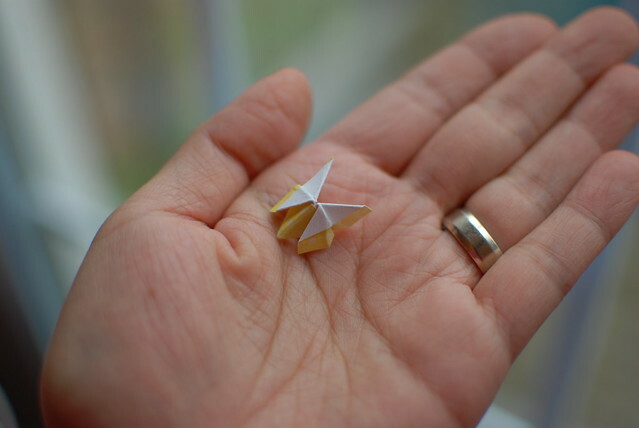 These little lucky ones will be mounted atop the nails. 6. With the pencil, draw dots where the nails will be hammered in. Then hammer in your nails. Don't worry if your little butterflies try to take flight while you are hammering, they don't go far, and you can re-arrange them later. 7. 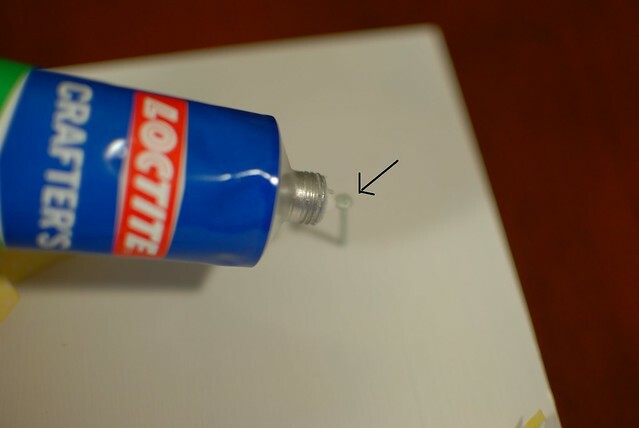 Add a dab of craft glue to the top of each nail, and place the lucky butterfly atop. Adjust it's angle as you please and let dry. 8. 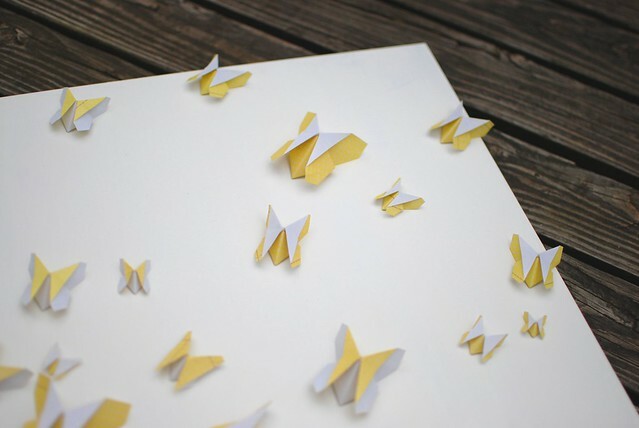 Apply craft glue to the bottom edges of each butterfly and secure it to the board. Let these butterflies dry. And there you have it. Display and admire your work!